Saturn’s moon Iapetus is just weird. When Giovanni Cassini discovered the moon in 1671, he found that he could see Iapetus only when it was on the west side of the planet; the moon, it turns out, is much darker on one side than the other and is tidally locked with Saturn so that one side always faces the planet. More recently, people have noticed how much Iapetus looks like the Death Star from Star Wars, complete with a large round crater and marked equator. The ridge that runs along 75 percent of the moon’s equator, giving it a shape somewhat like a walnut, has been a mystery since it was first spotted in 2004, when the Cassini spacecraft imaged Iapetus. Since then scientists have proposed theories for its origin that usually depend on some internal property of the moon, such as volcanism or plate tectonics. But scientists from the American Geophysical Union’s fall meeting in San Francisco say they have a new theory: Iapetus once had its own satellite, that is, its own moon. According to this theory, the satellite, created in a some kind of impact with another large object in the solar system, would have orbited Iapetus, but its orbit would have slowly decayed, bringing it ever closer to the surface and eventually pulling it apart. 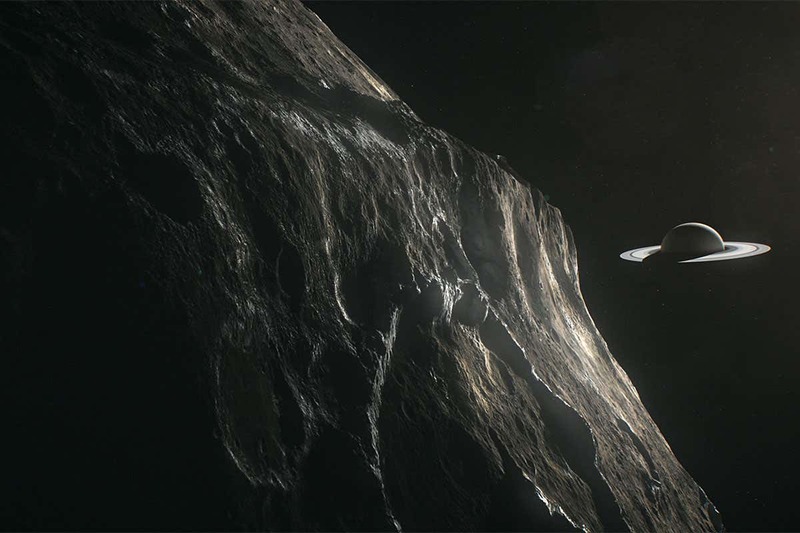 Those bits of former moon would have first formed a ring of debris around Iapetus’ equator until eventually the particles have slammed into the surface. “Particles would impact one by one, over and over again on the equatorial line,” said William B. McKinnon, a solar system specialist at Washington University in St. Louis. “At first the debris would have made holes to form a groove that eventually filled up.” It would have taken a lot of debris: the ridge reaches up to 10 kilometers in height, taller than Mount Everest. The scientists say that their theory is the only one to explain why the ridge sits on the moon’s equator and only the equator; plate tectonics or volcanism would be unlikely to create such a feature in that specific spot. However, the research is still in the early stages. The scientists have done the math but have yet to create the computer simulations that would further back up their theory.